So, I have some ideas. First, I was looking at craftynest.com and I saw that she had a magnetic board on her dresser with some of those Ikea magnetic clear-top circular metal containers stuck to it. I have always loved those containers and wanted a good way to use them so i could have an excuse to buy them on my next trip to Roundrock, Texas. Now I have a reason! 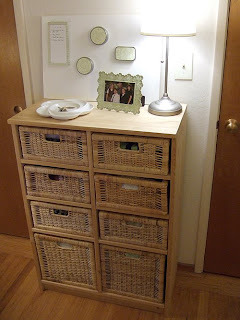 :) I have been looking at a better way to keep our dresser top clean (it is ALWAYS full of stuff). I think that I will look for a fun old cookie sheet with a nice patina and see if I can paint it to hang on the wall. 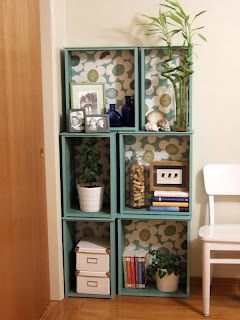 Then I'll get some of those cheap Ikea things and put earrings and broaches in them (with the clear tops the earrings will show through so i can see what I have). Then I'll get a few magnetic hooks (Mom, do you remember where you got the ones you have on the fridge for potholders?) and put them on it with necklaces hanging from that. Second, I have a reason to head back to Laverty's (an antique store in Waco). The other day I saw these great old doilies there and thought they were so fun looking. But I didn't have a good use for them, so I didn't' buy them. But now, I have an idea thanks to craftynest.com! See this photo? I think it would be a fun decoration in our bedroom. 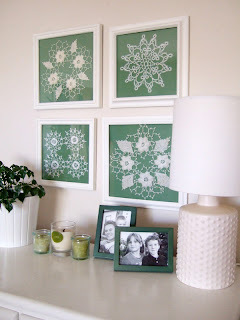 We don't have anything on our bedroom walls and the background paper behind the doilies could add some color to the room. 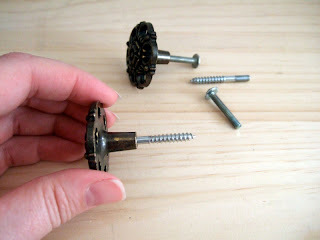 Then, I can hang the pictures from some nifty old repurposed drawer pulls! Just get old drawer pulls and take out the screw inside and replace it with a 1 1/2 inch long hanger bolt. Then drill a hole and screw it in. Place a ribbon hanger on the frame and hang from the drawer pull. I love it! :) Uh oh! Now I can't wait for the next weekend! :) I can't believe it is almost May! This post is a little overdue, but Isabelle was arguably a little overdue too! :) I haven't met her outside the womb yet, but I have prayed for her every day of her little life. Isabelle Grace, you are a joy. Thank you for gracing our lives and reminding us of what is really important. I can't wait to hold you this weekend! 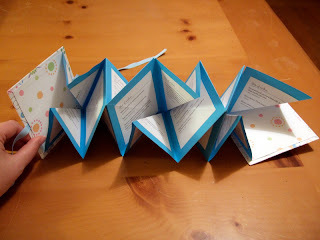 As soon as I found out that Sean and Theresa were expecting I was on the hunt for fun crafts to do for the little bundle. Over Christmas, Mom and I worked on some crafts for Theresa's upcoming baby shower. This was my gift, a baby sling in the ring-sling style. Of course, it had to be a pretty shade of purple for Theresa! 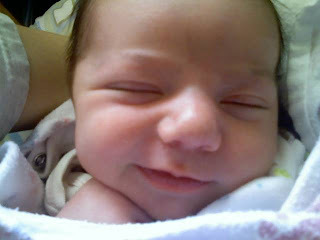 :) After prayers and waiting, Isabelle joined the outside world on March 14, 2009. She was 8 lbs, 2.9 oz. and about 19 inches long. And boy is she cute! In all seriousness, I loved painting these letters for Izzy's nursery. Izzy/Jelly-Belley/Belle/The Bellester, Auntie Carrie and Uncle Marc love you! 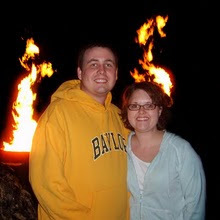 This is from Christmas 2008. I had to post it (because Blogger finally allowed me). I hope you enjoy. :) By the way, Old Black Joe really is a song. Click here for more info on it. Oh, Osc. ;) You're too funny! And another video... Did you really think I'd let you get away with just one?